Chocolate. Coconut. And marshmallow. Yummy! Bake up a batch of these deliciously fluffy Easter Bunny Cupcakes and you’ll have the whole family hopping for joy. Line a cupcake pan with paper liners and preheat the oven to 160c (fan)/180c/Gas Mark 4. Place all the cupcake ingredients in a large bowl and beat together until the cake mixture is even and well combined. Divide the mixture between the paper cases and bake in the oven for 20 minutes until golden and springy to the touch. Transfer the cupcakes to a wire rack and allow to cool fully. Beat the royal icing sugar with a little water to form a thick spreadable icing. Place the desiccated coconut in a small bowl. Coat the top of a cupcake with royal icing and dip it into the coconut to coat. Add a little royal icing bunny tail to the centre of each cupcake. Colour the remaining royal icing a pale pink and place into a disposable piping bag. 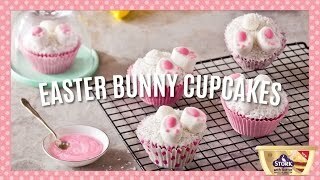 Cut each marshmallow in half and add to the top of the cupcakes to create the bunny’s feet. Pipe the pink pads and toes of the bunny’s feet with the pink icing. blackberry, dates, valentine's day, christmas, hot, toffee, white chocolate, cupcakes, easter nest cupcakes, lime, teatime treats, biscuits, loaves, christmas new year, bun, brownies, easter cupcakes, fudge, birthday, cake, nuts, cornflakes, muffins, teatime, pies and tarts, cakes, honey, apple, halloween, crumble, coconut, mother's day, raspberry, flour, father's day, cross, chocolate, easter, blueberry.